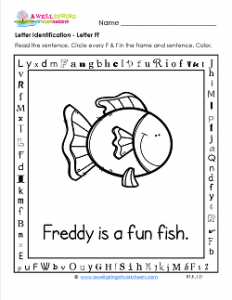 Hope you like and have fun with this letter identification worksheet for the letter f. “Freddy is s fun fish.” is the sentence the kids need to focus on. How many f’s care there in the sentence? Have the kids circle them all. What about the letter frame? How many f’s can they find? Just a heads up – there are 12 of them, three on each side. And if your kids happen to notice, there is a hidden sight word across the bottom of the frame – the word “my”. There is also the sight word “of” and the cvc word “fan” on the top of the frame. They weren’t intentionally placed there, but there they are! Have your kids color Freddy, too.